Empire Rose is a well built female coated in gold! She has been Parentage verified using DNA, so you know her outstanding pedigree is genuine! Classic studs included in her pedigree include Purrumbeti Inti, Purrumbete El Dorado and Jolimont Sculptor – and Empire Rose is definitely the quality product of her pedigree. Whether you have an established quality herd, or are just starting out, Empire Rose should definitely be added to your herd! Empire Rose annually shears more than 3.5kg fleece with a lovely dense blanket. Her 1st shear stats were: Mean 20µ, sv 4.17, comfort factor 98.3%. As is normal, her fleece has strengthened as she has aged, her last stats at 4 years old were mean 27µ, sv 4.7, comfort factor 80.2%, so her fleece has stayed consistent. Empire Rose has been mated to Highway Star Gold Flash (Light Fawn). Gold Flash is also DNA Parent Verified, his sire being the world famous Jolimont Attitude, and grandsire, the well-known Australian stud, Jolimont Sculptor. 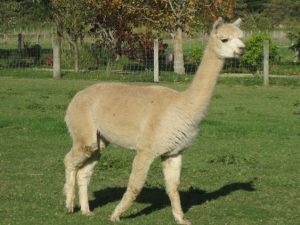 This cria will have an enviable depth of pedigree featuring some of the top alpacas in the world! Empire Rose has had 2 previous cria sired by Gold Flash – Empire Dawn and Strike, who had first fleece stats of 16.6 and 17 micron respectively, putting them well into the Elite class, and we are confident her current pregnancy will yield another elite alpaca.